The eternal and persistent question when outfitting a cruising boat is, always: “How Much is Enough?” Followed, of course, by the completely unanswerable question “How much will it cost?” I won’t try to answer the cost question, since it’s just too complicated, but I’d like to offer a few thoughts on the equipping side, since we’re nearing the end of that process now with Sionna. So the question of the day is, what is the absolute minimum required equipment, facilities and supplies? What can’t you cruise without? And naturally, the true answer to that question is; “That Depends”. Or perhaps it would be more accurate to say “It’s Personal”. When you come right down to it, what one crew feels is absolutely-stripped-down simple may seem, to others, to be ridiculously over-prepared. As I hope I’ve mentioned in other posts, Nicki and I are great and avid fans of Lin & Larry Pardey, the “first family” of long-term, minimalist cruisers. If you’re not familiar, check out their current site at L&L Pardey and consider reading their writings, too. Great stuff. In over a dozen books, DVD’s, and countless presentations and articles, (and over 150,000 miles of engine-less cruising under sail), the Pardeys have been tireless, vocal advocates for their cruising mantra (and indeed their 50-year lifestyle): “Go Simple, Go Small, Go Now”. It was their insistence on simplifying their boat, and their example of what is possible on a minimalist budget, that convinced me that maybe the cruising dream I’d been harboring wasn’t an impossibility, after all. It is upon such fragile foundations that alternative lifestyles are built! Let me just say, upfront, that we are not well-to-do financially. Also that we are not “poor”, at least in the way that I define poor. We live closer to the federal poverty line sometimes than I might wish, but we eat well and have reliable shelter, and vehicles to get us to work – because we must work when not cruising. There’s a small disability income from my previous career which helps level the income flow a bit, but in our world there is no wide-screen TV (actually we haven’t had a TV in 10 years, and I can’t imagine a need for one), no owned real estate, and no big new cars (ours are both 9-year-old sub-compacts, and well over 150,000 miles). Nicki is a fitness instructor, I’m a carpenter – a rather seasonal field in Maine. The only “toys” we allow ourselves are good shoes to protect Nicki’s feet, decent quality tools for my work and – being avid cooks and foodies – good knives and a Kitchen-aid mixer on the counter. So that sets the stage for our perception of “Required Equipment” on our cruising home. Cost is always a concern, and of course our cruising plans determine the type of equipment we’ll need in the near future. The cost-effectiveness of on-board equipment is carefully weighed, and then balanced against the absolute cost to determine if it’s even possible. Then, finally, comes the “gut-check”. If you’re not familiar with the gut-check concept, let me explain. We might look at a piece of equipment – say, radar – and decide that it’s cost-effectiveness is high; ie for the money, it would fulfill an important function well. In terms of total coast, the $2000 or so could be managed, though we would have to eliminate something else from the “want” list to swing it. But the gut-check is a feeling. It’s a look inside my soul that says “Do we really NEED this, or do I just WANT to need it?” I was a pilot once. I love radar and all the information it can give you, but on our boat do we actually need it – and its maintenance expenses -given the type of sailing we’ll be doing? If it’s not installed, you don’t have to pay to fix it when (not “if”!) it breaks. So, no radar. Because that’s how we wish to live, the ability to keep some of our provisions cold has significant gut-value to us, enough to justify the cost and upkeep of a small refrigerated space. It passes all three tests, (cost-effectiveness, total cost and the gut-check), so it stays. And if it makes a few ice cubes, that’ll be bonus. To increase the feasibility factor, I added 2” of foam insulation to all inside surfaces of the cooler, reducing it’s volume to about 4.5 cubic feet, and installed an Isotherm self-pumping refrigeration system, which uses the water surrounding the boat to dissipate the heat removed from the fridge. Simple, few moving parts, easily installed, and replacement parts (should they be needed) easily available and installed by the user. Then I added a 100 watt solar panel to cover most of the power requirements of the fridge. Voila! The next two years on Sionna will be mostly inshore or near-shore, as we travel down the Atlantic ICW (Intracoastal Waterway), cross Florida via the Okeechobee canal, and explore the Keys and Gulf Coast., then the Bahamas the next year. We won’t be crossing oceans (yet), and we won’t be months away from basic services and parts. Still, we may do some night sailing off the coast during the trip (Atlantic ocean and Gulf of Mexico), and from the Bahamas there may be an overnight to farther Caribbean destinations at some point. Friends, there’s a lot of traffic out there in places. Our first overnight passage last summer, from Maine to Cape Cod, turned into a marathon 30 hours of motoring in confused seas, fog and zero wind, crossing the shipping channels for both Portland, Maine and Boston, Mass. Were we nervous? Well yeah, we were. No way to see shipping beyond about 500 yards, and no way to hear them with the engine running. We had the VHF radio to announce our position, but that was it, and it felt pretty naked. It sure would have been nice to know if any of those big ones were out there. So we’ve installed a dedicated AIS transponder (Automatic Identification System), which overlays it’s information on a GPS chart plotter display in the cockpit. For the price of most plain AIS systems, we got a small (5” x 9” screen) combined AIS/chart plotter with current electronic charts all the way to the Bahamas. Cost effective, affordable, and it’s giving me a warm, fuzzy feeling before we even get it in the water! Sometimes technology really does feel like a wonderful thing. We still won’t have a TV aboard, though. One other thought about the cost of cruising. I’ll end with a list of all the things we’ll have aboard that we had to add, but keep in mind that ALL installation and routine maintenance labor is provided by Nicki and me. If we’d had to hire someone to do all this, at commercial going rates, we’d never leave. Really. I figure that would have added about $22,000 worth of labor to the process, and would have instantly made this whole cruising dream impossible for us. The choice is pretty clear: Deep pockets, or DIY. Manual Windlass, saved from the project boat. Additional anchor rodes – we have three complete chain/nylon combination rodes and spares for another. 10 docklines, two over 30′ long. A dinghy we can stow on deck for passages. Second chart plotter on Android tablet..
Hand-held VHF radio (In addition to existing fixed VHF). Stereo system (USB, MP3, CD, AM/FM). Propane, with control/safety system and 22# (4.8 gal) propane capacity. Re-plumbed the entire fresh-water system, and rebuilt the port 75 gallon water tank so it won’t leak. Added spares for rigging, engine, filters, belts, etc. Added tools for boat maintenance/repairs and basic carpentry, in case I get a chance to work along the way. So there’s our list of upgrades. What would you do? Would your list of “must-haves” be significantly different? Have we forgotten anything? I’m not sure exactly what happened, but I’m not laughing anymore. Maybe it was the cumulative erosion of my psyche by 54 northern winters. Perhaps some fatal flaw in my character has finally been revealed. Or maybe I’ve finally grown up. Whatever the reason, since last year, the words “I’m a” and “snowbird” have somehow found themselves combining in my mind and speech in a most agreeable way, which leads to the current adventure of the crew of Sionna: We’re vacationing in Florida for two weeks! Ok, maybe we’re enjoying it just a little bit. But we have accomplished some very important work, too. We’re spending some great time visiting with Nicki’s parents, whom we’re staying with here in Bradenton, for one thing. There were new gear dealers, but no more than we see in good old Rockland Maine at our annual Boats, Homes & Harbors show in August. There were a lot of boats there; most new, a few used. We’re not in the market for a boat, so maybe that effected my interest more than expected, but I found myself growing bored looking through “yet another new party boat”. And the new boats we saw – from a dozen manufacturers from around the world – mostly left me wondering “What the hell were they thinking?” All had great features, yes – but all had gaps that the “fix-it-yourself, worse-case-scenario” guy I am found troubling. But we weren’t buying a boat, so I guess that’s ok. I feel sorry for the newbie with plenty of disposable income and not much knowledge, though, and we saw a bunch of those, being bombarded with bad advice by the boat brokers. Yikes! We did, however, see one product (and only one) that we both sighed over, and if we had the budget would so pursue: Soft decking. I love the look of teak decks, but wouldn’t have one because of the maintenance, and the certainty of leaks. One of the boats we toured looked like it had a very blond teak deck, but when you kicked your shoes off (required to tour a boat at a show) and stepped aboard, the deck had just a little give to it. It was a dense, closed-cell foam of some sort, and gave the surest, most comfortable footing I’ve ever found on a boat. Delightful! Anyway, enough of the show. We stayed the night with some family who live about an hour north of Miami (a drive which took us three hours – did I mention Miami traffic? ), and from there headed to Indiantown, FL, and the Indiantown Marina. The author of one of my favorite cruising blogs – The Cynical Sailor – is spending some time there, and we’ve been considering it as a place to store Sionna when we leave her in Florida the summer-after-next, so we thought it would be great to view the marina AND maybe meet Ellen of s/v Tickity Boo at the same time. Surprise, surprise, we managed both! Ellen proved to be gracious and charming, as well as willing, and gave us a complete tour of the facilities (which are very nice, and relaxed at the same time), as well as a recommendation from her experiences. We’d barely stepped out of the car before some folks enjoying the patio invited us to join the cruisers BBQ that evening (which we sadly had to decline, but next time…!) The folks in the office were smiling and helpful, and, well, the whole thing just felt right. We’ve found our Southern base of operations. Thanks Ellen! Other highlights? Well, it’s been warm. And sunny. And since we left Maine they’ve had three snow events and temperatures consistently below zero (Fahrenheit!). We went for a walk in Desoto Park yesterday and it was sunny. And warm. Did I mention it’s been warm? I may be turning into a three-toed-sloth. Categories: Cruising, Facilities, Sailboat | Permalink. “Tunk” is a sound no boat owner wants to hear – at least no fiberglass boat owner. It’s a sound which invokes images of unknown weakness, possibly extensive and expensive repair work, and just generally bad things. Maybe. In any case, it’s a sound that rates right up there with “Plunk”in our book, which is the sound made by a dropped, expensive tool as it takes a dive for the freedom of the deep. Good, solid fiberglass laminate (the alternating and intermingled layers of fiberglass cloth and plastic resin that make up a boat hull) makes a very clear, sharp “tack” sound when you gently tap on it with a light hammer or the handle of a screwdriver. It’s what you hope to hear when you’re inspecting the condition of a boat, whether you already own it, or are thinking of buying it. But fiberglass has a serious weakness, which is that it’s not really waterproof. It’s very water resistant, yes, and if properly maintained will act waterproof, but if water does find its way into the laminate, it begins to migrate… The result can be a release of the bond between the layers of glass, or the wood core used between major layers. That break in adhesion creates a hollow, and that hollow results in the “Tunk” sound that brings despair to the boat owner. …And joy to the boat repair shop. Delamination repair is labor-intensive (and therefore expensive), though it’s not particularly difficult. When we were buying Sionna last year, we had a pre-purchase survey done by a very thorough fellow, and received a recommendation that we remove and inspect a couple of the chain-plates (which are original 1963 equipment), as well as repair a mild crack in the surface on each side of the deck near the aft end of the cockpit. Starboard forward chain plate removed, which pulled up the surface of the deck. partway down, showing cracked surface and dark moisture staining of wood core. These were both “You might want to look at these areas someday” recommendations from the surveyors point of view, but because the boat is insured, the insurance company gets to decide what THEY think is important – and those items got flagged. So (being a staunch DIY kind of guy) I pulled the two forward chain-plates at the main mast for inspection. Both bronze castings passed inspection with flying colors, naturally, but not so the deck through which they had been pulled! A significant bit of the upper deck pulled away during the removal, revealing discoloration – a sure sign of water intrusion. I was about to have my first lesson in deck laminate repair. On Sionna the decks throughout are a sandwich of ½” marine plywood, with a 1/8”-3/16” layer of fiberglass on each side. This is a common construction technique, though frequently balsa wood is used for the core, and in modern boats it’s now often a plastic honeycomb material instead of wood. In our case, because the damaged area was quite small, the answer was to grind out the fiberglass around the area to a shallow slope, and then use epoxy and glass cloth layers to fill in the resulting void, sand it out fair with the old deck, and then repaint it. With luck you’ll hardly know there was ever an issue, but more importantly, it won’t leak! After grinding, the required number of layers of glass cloth are laid out, largest first, providing about 1” of under-lap all around where feasible. The epoxy is then applied to each layer so everything is well saturated, and allowed to harden, with the chain plate in place. and filled with thickened epoxy to create the shelf around the chainplate. The shelf is then filed and sanded to it’s final shape and smoothness. And finally, paint is applied to protect the epoxy repair. The chainplate cover, installed with 3M 4000 sealant, and four screws. And that’s really all there is to it. A rather dirty job, what with the grinding, but not hard, and once accomplished, it should be better than new for many years to come – which in my book is a perfect boat project! 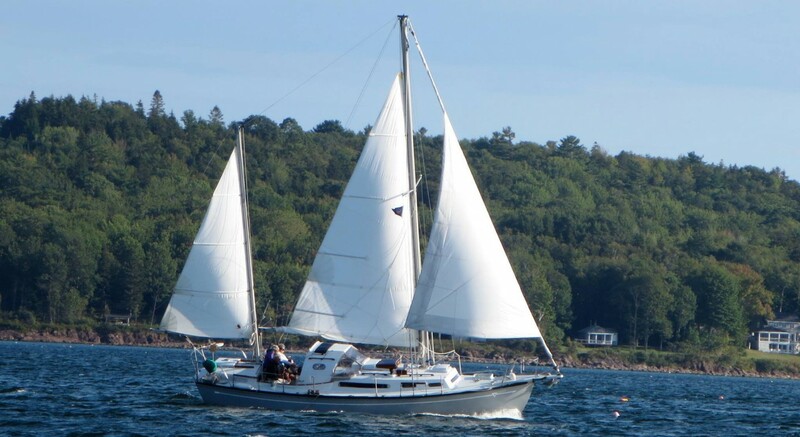 Categories: Boat maintenance, Cruising, Frugality | Permalink.